The biggest source of frustration with the sequel to Fantastic Beasts and Where to Find Them relates to it being a middle installment of a much larger story. As such, it’s a stepping stone from the introduction into a meatier narrative. It lacks its own individuality, not having much of a story to tell. Unlike its predecessor, which offered a self-contained tale within a larger framework, The Crimes of Grindelwald is all about world-building and getting viewers ready for what is yet to come. (According to what I have read, screenwriter J.K. Rowling and director David Yates are planning a five-movie arc.) 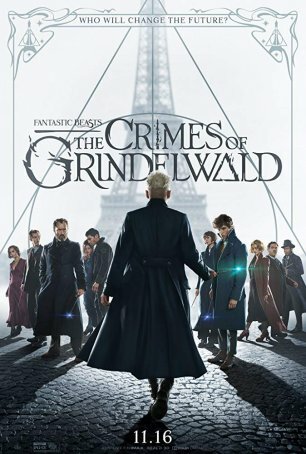 Assuming the pentalogy has a satisfactory conclusion, it’s easy to see The Crimes of Grindelwald working better as a single chapter in a completed series than as a stand-alone big budget holiday motion picture. Despite being light in the story department, The Crimes of Grindelwald offers plenty of small pleasures and tightens up the linkage between this series and Harry Potter. The most obvious is the introduction of a younger, mid-1920s version of Albus Dumbledore, with Jude Law taking on the role that was first essayed by Richard Harris then, after his death, Michael Gambon. There’s also a visit to Hogwarts, which doesn’t look sufficiently different in 1925 than it would 75 years later. Rowling, who has always exceled in her ability to craft interesting backstories, expends much of the movie developing the murky politics on both side of the Atlantic during the interwar period. It’s no coincidence that the main villain, the diabolical dark wizard Grindelwald (Johnny Depp), is played with more than a passing nod to Hitler: charismatic and charming when he needs to be but driven by megalomaniacal and genocidal impulses. His goal is straightforward: not only allow the wizards to come out of hiding but give them dominion over the world. Muggles have their uses but only as subjects of the pure-bloods. He insists he is a force for peace, showing a future-projection of what the humans will do if left in charge: World War II and the atomic bomb. The major characters from the first film are back although their roles have been marginalized. Newt Scamander (Eddie Redmayne) is still the putative lead. He spends the first half of the film trying to locate his quasi-love interest from the first film, Tina Goldstein (Katherine Waterston), and, once he has found her, helping her in her quest to learn the true identity of the mysterious Credence Barebone (Ezra Miller). Newt is acting as an agent for Dumbledore and we learn bits about his history, especially as it involves his time at Hogwarts and his relationship with Leta Lestrange (Zoe Kravitz). Muggle Jacob Kowalski (Dan Fogler) and his ditzy mind-reading girlfriend Queenie (Alison Sudol) are along for the ride (most of the time), although her willingness to accept Grindelwald’s poisonous message creates a rift. The characters are little more than pawns in a larger chess match where the kings are unquestionably Dumbledore and Grindelwald, once “closer than brothers” and now (as we know from Harry Potter lore) destined to battle one another. The best moments in The Crimes of Grindelwald are the character-based ones. For a movie that wallows in spectacle – there are a lot of gorgeous special effects sprinkled throughout the 135-minute running time – it’s ironic that the smaller, more intimate scenes have the most impact. Redmayne and Waterston re-ignite the spark that made their interaction delightful in the first film. There’s enough sense of regret to inject a dose of pathos into the triangle formed by Newt, Leta, and Newt’s brother, Theseus (Callum Turner). Scenes inside Newt’s briefcase provide comedic respite but, for the most part, the “fantastic beasts” of the title are limited to cameos. Most of the action sequences are high on razzle-dazzle and low on tension and excitement. The hijacking of the airborne prison-carriage near the beginning looks great but is devoid of suspense. Likewise, there’s no real sense of danger in the final struggle where blue and orange flames duel. One problematic aspect of the movie is the introduction of Credence and his beloved Nagini (Claudia Kim). Their story is inelegantly inserted at odd and awkward places because the purpose of the climax and denouement relates to Credence’s identity. There’s not enough time to effectively develop them and, as a result, the “big reveal” is more a point of curiosity than anything else. Don’t expect many gasps. The returning actors – Redmayne, Waterston, Dan Fogler, Alison Sudol, and Zoe Kravitz – slide nicely back into their roles. This time, however, they have less to do. This is especially true of Redmayne. Although the Fantastic Beasts saga is designed as his story, he’s left mostly as an observer to events in this segment. Jude Law is instantly recognizable as Dumbledore – he has the air of assurance he radiated in all of the Harry Potter movies. And those who worried that Johnny Depp was going to ruin Fantastic Beasts can breathe a sigh of release. Depp is restrained and contained. His performance is chilling without being over-the-top. There’s not a hint of Captain Jack to be found. I ended my review of the first movie by praising the stand-alone aspects of Fantastic Beasts and Where to Find Them but questioning its ability to extend into a longer series. My reaction to The Crimes of Grindelwald is the opposite. The movie does an excellent job assembling pieces and preparing viewers for the larger picture but disappoints in its ability to stay focused and provide a reason why this film needs to be seen now. Harry Potter fans will no doubt be enthralled by this diversion but others may be a little frustrated that it’s going to be two years before the next act in this play is revealed.